New SEMA videos from SCRS and Collision Hub give auto body shops not only a taste of the Las Vegas show itself but also insight into the business decisions of General Motors and BASF. In one, GM wholesale wholesale dealer, customer care and aftersales manager John Eck describes the past year’s evolution of MyPriceLink from the industry-riling bombshell at SEMA 2014 to the “‘Oh. That’s it? '” feature which launched Dec. 1. In the other, BASF marketing director Dan Bihlmeyer discusses the company’s effort regarding providing business services to collision repairers. Both men also talk about the need for auto body shops to stay educated on the latest trends in the industry during their interviews with Society of Collision Repair Specialists Executive Director Aaron Schulenburg. Check out the videos below; beyond the information, there’s some good SEMA vehicle eye candy — and Jay Leno! Eck acknowledged that the 2014 proposed MyPriceLink method of delivering real-time list prices would have been “very disruptive” to collision repairer workflow. Now, after collaboration with all the stakeholders, MyPriceLink launched fully integrated into shops’ estimating systems Dec. 1 without change to the business’ workflow at all. The first week was uneventful, Eck told us Thursday. Bihlmeyer says BASF had two SEMA booths this year. One to promote its paints (drawing the visit by Leno, a Glasurit fan) and the other to promote the company’s collision repair direct services. Schulenburg noted that some of the BASF experts were among those participating in the Repairer Driven Education series, and another panel was all BASF customers. 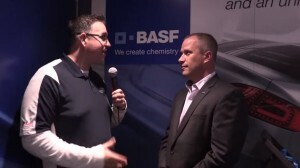 The companies were both sponsors of the Repairer Driven Education series — in fact, BASF was the first company to ever contribute to the event when it debuted last decade.